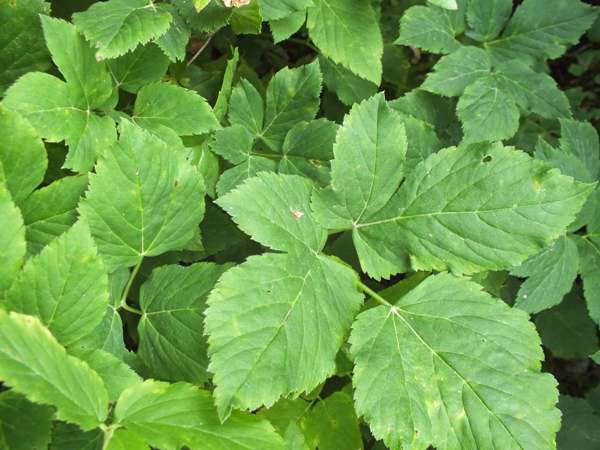 Most gardeners hate Ground Elder because its creeping underground stems (known as rhizomes) spread so rapidly, often producing dense patches on roadside verges, in churchyards and on riverbanks. Once established this perennial plant is very difficult to eradicate. 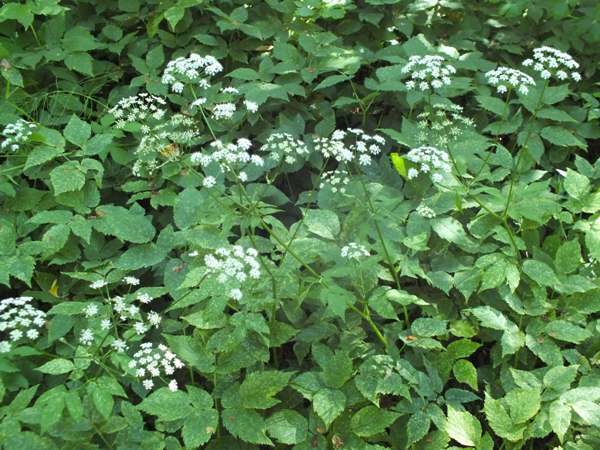 Although Ground Elder can grow up to a metre tall, half that height is more normal. The hollow stems are grooved but hairless and the leaves are darkish green in early springtime, turning yellower in summer. 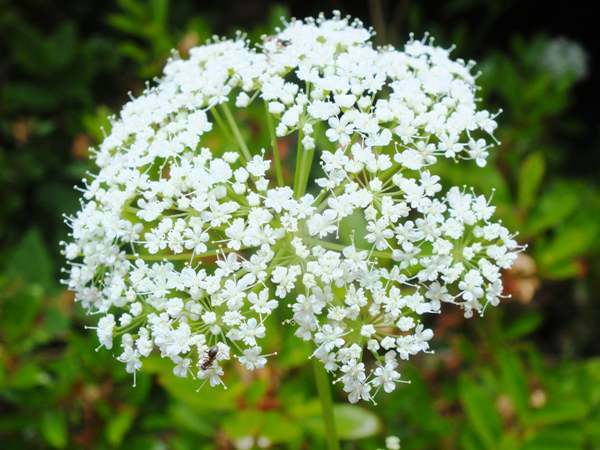 Flat-topped umbels of white flowers bearing a passing resemblance to the flowers of an Elder tree are the origin of this plant's common name..
Found throughout Britain and Ireland, Ground Elder occurs also in most parts of mainland Europe and in Asia. As an introduced alien species this plant is a nuisance weed in North America, New Zealand and Australia. It is considered possible that the Romans may have introduced ground elder to Britain; a clue as to why they might have done so can be found in one of its many other common names: Gout Weed! 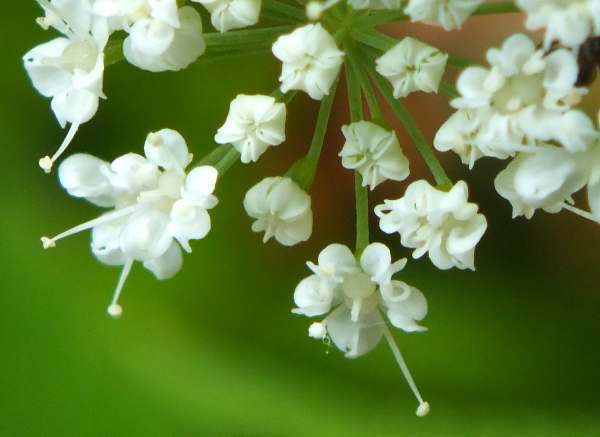 Ground Elder favours damp soil and shady locations, but it copes well with soil disturbance and so is often associated with waste land and the margins of rubbish tips. The first flowers appear in May and are usually past their (unspectacular) best by the end of July; however, cutting before the flowering season is ineffective as a control mechanism because this plant is propagated mainly via its spreading roots; leave even the tiniest piece in the ground and it will quickly give rise to a new plant. Even Ground Elder has its uses. At one time this common wildflower was grown as a pot herb, and it was also used in herbal remedies for arthritis and gout. Aegopodium, the genus name, may come from Aix- or Aig- meaning goat, and -podium, meaning foot. The specific epithet podagraria repeats pod- = foot (a reference to the underground rhizomes), to which the term -agraria, meaning 'of cultivated land', is appended.